This will probably remind you of those amazing maps of Facebook connections across the world. But once you digest these Just Cause 2 maps, you realize that they’re a damn sight more powerful. You’re not just seeing a sprawling, 3-D map of the game. Rather, you’re actually seeing a map of people in that game. The denser the white areas, the more people have died there. Dense white spots are data visualizations of extreme difficulty and danger. The denser the white, it follows, the more difficult and dangerous the area is. Game designers could use maps like these to create better games. While the map is just an experiment for now, the possibilities make you gasp. 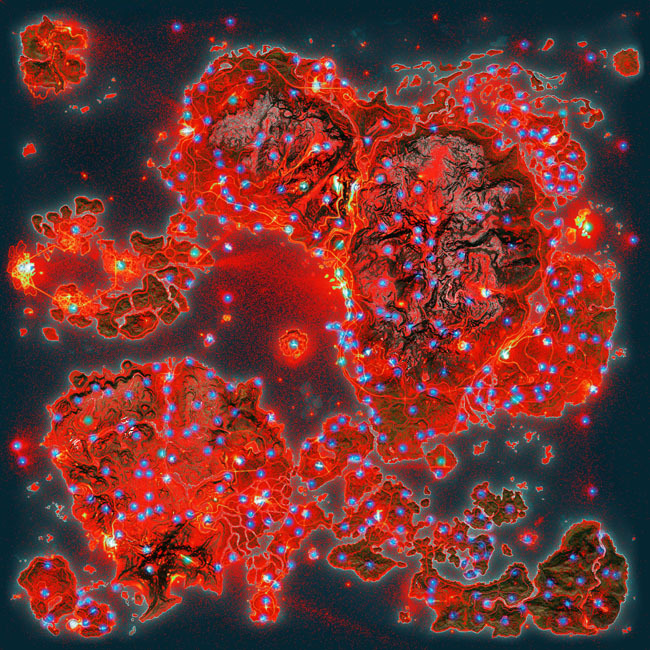 As a player, you can imagine maps like these essentially become what every solider dreams of having: A true, 3-D map of danger, so that you can take precautions accordingly (or simply save your game before you’re about to get into some hellish firefight). As a game designer, you could use maps like these to create better games. By consulting them, you could see where player frustrations mount. And you could see bottlenecks or blanks spots where the action is too intense to be fun, or has become so sparse that it’s boring. Game developers have always relied on intuitive notions of game difficulty to design their boards and maps. But what if they could apply actual quantitative analysis to build a better experience?